A Diamond Select Toys release! When you need a bottle opener, there's no time to dilly-dally. 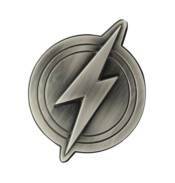 Show your friends how fast you are at fulfilling your hosting duties with this metal bottle opener in the shape of the Flash's logo from Justice League! Cast in solid metal and measuring approximately 4 inches long, this opener also has magnets on the back, so you can stick it to your refrigerator or global threat monitoring station for a more rapid response time. Thirst never waits! Packaged in a full-color slipcase.